A simple toss with fresh veggies, Colby and Monterey Jack cheese crumbles and chopped chicken results in a quick spinach salad with great flavor. 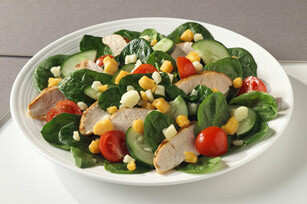 Toss spinach with chicken, tomatoes and cucumber in large bowl. Prepare as directed except do not toss with the dressing. Cover and refrigerate until ready to serve. Add dressing just before serving.